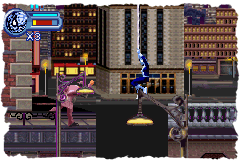 We're almost finished with Spider-Man's lead roles in Marvel video games - all that remains, for now, is a bunch of Spider-Man games for the Game Boy Advance. 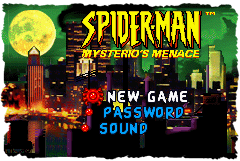 The first of them was Spider-Man: Mysterio's Menace, a stand-alone curiosity item forgotten by time - no wonder, since Spider-Man games just kept on coming back in the day, and handheld exclusives like this game were almost bound to fail, commercially. Well, it's my job to make you remember. Spider-Man: Mysterio's Menace - here we go. Mysterio is attempting to take over Manhattan with the help of Rhino, Hammerhead and Big Wheel. Meanwhile, Spider-Man's torn between taking the villains down and getting a fishbowl for Mary Jane. Seriously - I'm not making this up. I didn't know a thing about this game just a while ago. Whenever I start research on a title that has come out during the last few generations, I immediately head to Game Rankings to get a feel of how well the game has fared in gaming media. I was surprised to see Spider-Man: Mysterio's Menace rated pretty high with the average score of 80.38% calculated from 20 (!) reviews. It's actually the 7th best-rated Spider-Man game listed on Game Rankings, falling just behind the PlayStation 2 version of Spider-Man 2 (the movie-based game), which many critics consider a classic. High hopes, high hopes. Spider-Man: Mysterio's Menace could easily be called Spider-Man 3, 'cause it shares a lot of similarities with the two games released on Game Boy Color. I guess what happened here is that they ran out of good ideas for suitable villains (if this was the case, I could've helped...), and ditching the numeral justified the recycling of a Sinister Six member. 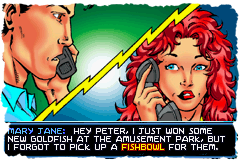 It could've also been just an attempt at a whole new start for a new generation of handheld Spider-Man games. Well, it didn't come far enough from the previous games to have been a whole new start, but it's definitely the best out of the three games. It retains the stuff that made Spider-Man 2 rise high above its predecessor, and shines even brighter with a moderately fast pace and much more interesting level design. Surprisingly, the audiovisuals are the worst part of the game. The music is quite horrible, in fact. While the game isn't outright ugly and should please a Spider-Man fan, it isn't much of a leap forward from the Game Boy Color titles, seriously. The capacity allows for level design that looks a little less like copy/paste and there's the occasional pseudo-3D environment to admire, but character animation, for example, really doesn't look that different from Spider-Man 2: The Sinister Six - just slightly smoothed out. Another superhero game that Spider-Man: Mysterio's Menace reminds me of besides its predecessors is... Darkwing Duck on the NES. Before you start blasting me - YES, it's a superhero game for sure! And YES, I meant that as a compliment since it's one of the greatest NES games ever made. The initial layout of the game is quite similar, as there are three stages you can beat in any order. Beating the first stage unlocks a second stage to form a whole level, so there are six stages in all. Beat them all, and you go one-on-one with Mysterio in one final level. 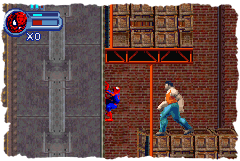 The gameplay is very similar to that of Spider-Man 2: The Sinister Six. The Spider-gadgets are pretty much the same - easier to use since there are more buttons now - and Spidey's basic moves are exactly the same. Collision detection fails from time to time, but it's not as much of a problem as it was in the first game of this series. Spidey's movement speed is once again on the slippery side, but again, not the problem it once was. As an extra gimmick, Spidey can grab hold of different suits (including the Venom symbiote) which protect him from certain obstacles or give him different perks. That's kinda cool. All in all, Spider-Man: Mysterio's Menace is a reasonably entertaining game. I wouldn't go calling it great or the most essential addition to your Marvel video game collection, but it's good - I can most definitely call it one of the better Spider-Man games from yesteryear, now that I'm this close to the end.